Texas (i /ˈtɛksəs/) is the second-largest U.S. state by both area and population, and the largest state in the contiguous United States. The name, meaning "friends" or "allies" in Caddo, was applied by the Spanish to the Caddo themselves and to the region of their settlement in East Texas. Located in the South Central United States, Texas is bordered by Mexico to the south, New Mexico to the west, Oklahoma to the north, Arkansas to the northeast, and Louisiana to the east. 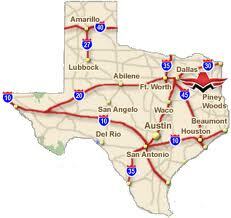 Texas has an area of 268,820 square miles (696,200 km2), and a growing population of 25.1 million residents.